First I must apologize for being awol for a while. Life and work have been getting in the way lately of my blogging efforts. Although I have been cooking here and there and have several dishes to catch up on. I wanted to share a meal I made a couple weeks ago. This was a four course meal starting with a light Greek salad. The foundation of the salad is a bed of romaine and red leaf lettuce. That was tossed with a rather simple but flavorful lemon and olive oil dressing. 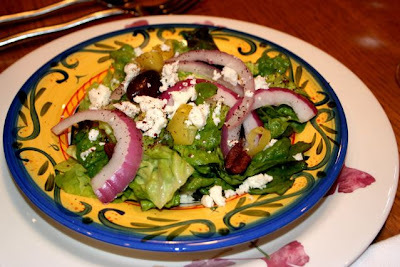 The salad is topped with sliced red onions. I like to soak them first in ice water after slicing to tame down their heat. There’s also some greek salad peppers, kalamata olives and, of course, feta cheese. The whole thing was garnished with a bit of sumac powder. 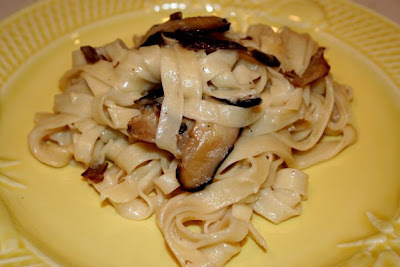 I have been on a real pasta kick lately and it started with this fettucine al fungi. Homemade pasta is so simple to make that I can’t understand why I don’t do it every day. I never really measure for my pasta. Sometimes I’ll use egg, sometimes not. Just mix some flour, egg, water and salt, knead it until elastic, and let it rest for a bit before rolling out. I have a pasta roller that makes easy work of it. Nothing can beat the taste and texture of fresh pasta. This evening I made a mushroom, cream and cheese sauce for it. It has three kinds of mushrooms – dried shitakes (soaked), fresh shitakes, and fresh baby portabellos. These were sautéed in a pan with good olive oil and of course lots of garlic. A splash of cream and a splash of truffle oil were added and the fresh cooked pasta was tossed in. A handful of grated parmigiano reggiano was added and the pasta was plated up. Beef was on the menu for the main course. As a unifying theme I went with beef and mushrooms but I moved from the Mediterranean to Asia with this sesame, garlic and soy marinated beef. It was a pretty simple stir fry but had plenty of flavor. 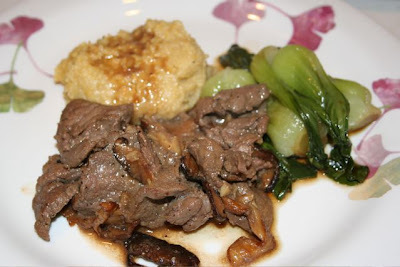 I served it with polenta that had been cooked with the retained liquid from soaking the mushrooms. I also served up some baby bok choy seasoned with soy and sesame oil. 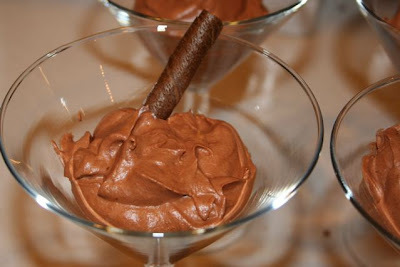 For dessert a rather simple chocolate mousse. Nothing fancy here. I just melted some good chocolate and folded it in to some whipped cream. That’s it! Easy as mousse. Well, ok, not BBQ chicken breast or legs or wings. How about BBQ chicken feet? 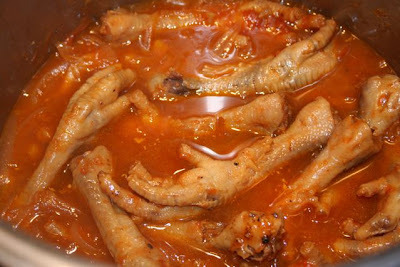 I’ve never made these before but I absolutely love chicken feet. It’s probably for the more adventurous but they really are delicious if prepared well. There isn’t really any meat to speak of. All the nutrition comes from the skin and the cartilage and connective tissues. Like any meat with lots of connective tissue, they need to be cooked for a very long time to break down and soften these tough proteins. 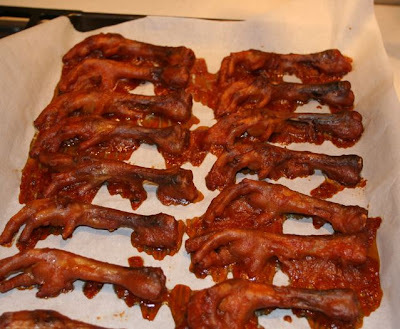 If cooked properly they just melt in your mouth and you just spit out the bones. 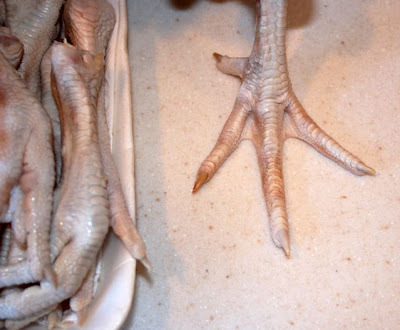 Chicken feet do need some preparation before you can cook them. You’ll notice that there are rather sharp claws on them buggers. So, the first thing one needs to do is clip them all off. Easy to do with a sharp pair of kitchen shears. Next I scrubbed them well with salt and washed them off. Then the feet were blanched for five minutes in a pot of boiling water. After that they are ready to be cooked however you like. I decided to use my pressure cooker and a sweet and sour BBQ mustard sauce. I started with about a half cup of good spicy commercial BBQ sauce. I’m partial to Famous Dave’s Devil’s Spit sauce. To this was added a few squirts of regular old yellow mustard, a sliced up onion, a few cloves of garlic, a couple tablespoons of citron marmalade and about a cup and a half of the cooking water that the feet were blanched in. The feet were added to the pot and it was cooked under pressure for about an hour and a half. 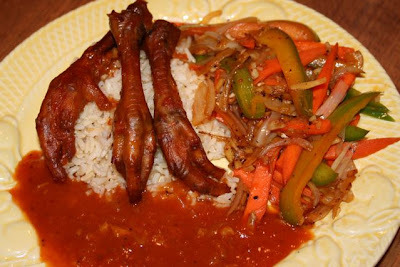 I actually made these chicken feet over two days. After cooking in the pressure cooker I put the feet, sauce and all, in the fridge to rest until the next evening. I placed the cooked feet on a baking sheet and baked them in a low 225 °F oven for about an hour until the feet were nicely warmed and the sauce sort of caramelized on them. The feet were served atop a bed of brown rice. I reserved some of the tangy BBQ sauce and added that to the plate. I also had a side of stir fried vegetables. The chicken feet came out just as I had hoped. They tasted sweet and spicy with a hint of sourness. The bones just fell apart and the delicious broken down proteins just melted off of the bones in your mouth. I was happy and fortunately no one else would touch them so I get them all to myself! I adore pasta. A simple food but one that is so satisfying. 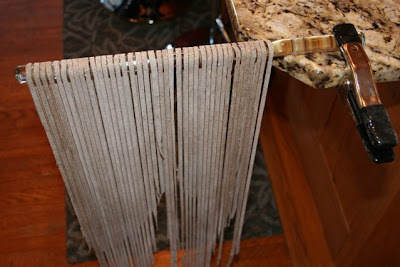 Fresh pasta is so much better than the dried kind too, and it’s really not hard to make. It is especially easy if you have a pasta rolling/cutting machine to help you out (which I do). I had in mind to make a pasta last night and when I was rummaging through my pantry I saw a package of buckwheat flour that I had forgotten about. Perfect! 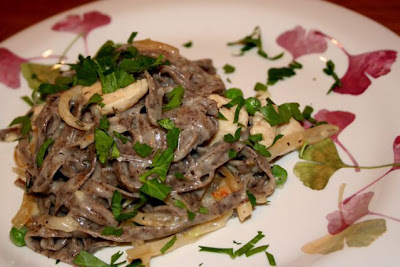 Buckwheat pasta. I love Japanese soba noodles and thought I could use the flour in a more Italian inspired pasta. So, I made some fettucine. I made a rather soft dough using 1 cup of unbleached all purpose flour, 1/2 cup of buckwheat flour, 1 tsp of salt and about 3/4 cup of water. This was kneaded in my kitchenaid for about 5 minutes until it was nice and stretchy. I wrapped it in plastic wrap and let it sit for about an hour. I rolled it out using my pasta machine then ran it through the fettucine cutter to make long strands. I needed to use quite a bit of flour along the way as this was a pretty wet dough. I let this hang to dry for a while so it would be easier to handle. I have had problems before just piling up my pasta and coming back a few minutes later to find my nicely cut ribbons all stuck together in a big mass of dough. Hanging them helps to keep them from clumping together. My fettucine was flavored with a creamy chicken, rosemary and pea sauce. I started by sautéing cut up boneless chicken breast. This was removed and set aside to be added back at the end. I caramelized some onion in a pan and near the end added chopped garlic. The peas went in along with a few tbsp of chopped fresh rosemary and this was cooked for just a minute. About a cup of milk with 2 tbsp of flour whisked in was added to make a thickening cream sauce. It actually thickened too much. I used way too much flour I think. I’ll have to really cut it down next time. I did thin it out a bit with some of the pasta water, but it was still a little too thick and pasty in the end. Lessons learned! I threw in the chicken to reheat with the sauce. In went the freshly cooked pasta and a half cup of parmigiano reggiano. Overall it had a pretty good flavor. The texture of the pasta was very nice. Next time I have to make this the right way with cream and cheese to avoid the bland pasty sauce. I was kind of in a Mediterranean mood last night. My original thought was to make some kind of homemade pasta with chicken. I was thinking I would make something like my creamy chicken and rosemary pasta but with homemade noodles. But when I got home from work I had no flour to make pasta. So I had to look through my pantry to find something else. That’s when I spied a big container of yellow corn meal that I haven’t touched in a long time. Of course! Polenta. It’s easy to make and delicious. You simply whisk in some corn meal and salted water and cook it with stirring until it is thick and creamy – about 40 minutes. You can add cheese to it if you like or even cream or butter. I left it non-fat as it was creamy and delicious enough. To go with the bed of polenta I made a stuffed chicken breast. I started with a boneless skinless chicken breast that was pounded out very thin. It was stuffed with a mixture of green olives, Italian peppers and a bit of feta cheese. This was just ground up in the food processor, slathered on the chicken and the whole thing was rolled up. I seared it on both sides in a hot pan and finished it off in the oven until it was cooked through. 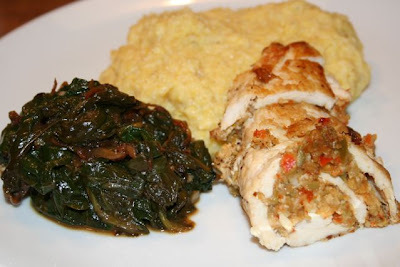 Accompanying the chicken and polenta is a bit of sautéed onions and baby spinach flavored with lemon juice. Well, that’s what we call it when we start with some meat, throw in vegetables and water and boil away. I often make this from leftover roasts. 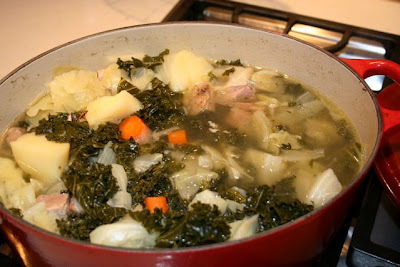 A simple country dish, it really is easy to make. I started with some leftover pork shoulder roast that we had the other night. I just cut it up into cubes. Added a cut up onion – you want big pieces. Some carrots and potatoes went into the pot. I also added some kale and cabbage. This was covered with water and seasoned with salt and pepper. It was simmered until the potatoes and carrots were soft. To sop up the juices I threw together a quick whole wheat Irish soda bread. 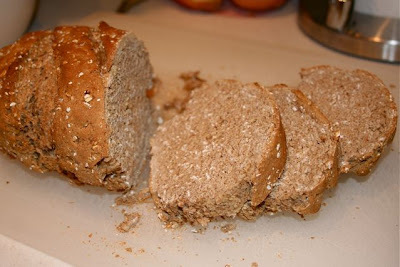 This was simply made from 3 cups of whole wheat flour, 1 cup of rolled oats, 1 tsp baking powder, 1 tsp baking soda, about 1.5 cups of milk, and some salt. A little dense and dry but it was hearty and delicious soaked in the soup.